There are many different ways and settings in which the curriculum can be developed to provide clinical legal education to students at university level within the UK. 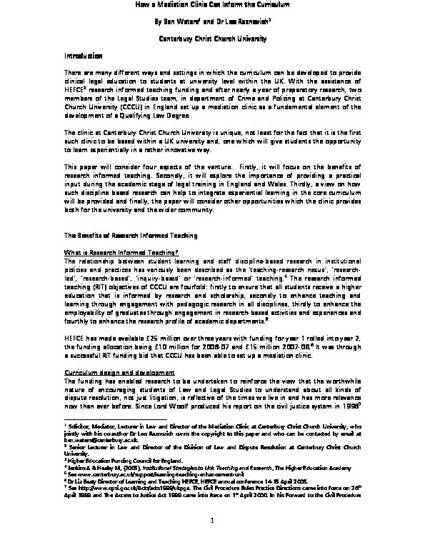 With the assistance of HEFCE research informed teaching funding and after nearly a year of preparatory research, two members of the Legal Studies team, in department of Crime and Policing at Canterbury Christ Church University (CCCU) in England set up a mediation clinic as a fundamental element of the development of a Qualifying Law Degree. The clinic at Canterbury Christ Church University is unique, not least for the fact that it is the first such clinic to be based within a UK university and, one which will give students the opportunity to learn experientially in a rather innovative way. This paper will consider four aspects of the venture. Firstly, it will focus on the benefits of research informed teaching. Secondly, it will explore the importance of providing a practical input during the academic stage of legal training in England and Wales. Thirdly, a view on how such discipline based research can help to integrate experiential learning in the core curriculum will be provided and finally, the paper will consider other opportunities which the clinic provides both for the university and the wider community.